Senate hearing turns sharply partisan, with Democrats claiming that the TSA is doing "a terrific job" and a Republican saying, "I wouldn't want my wife to be touched" that way. Foes of the Transportation Security Agency's new air-screening procedures, including law enforcement-style pat-downs and what have been called "virtual strip searches," had hoped that today's Senate hearing would lead to a privacy outcry on Capitol Hill. Not quite. The hearing quickly cleaved along partisan lines, with Democratic senators applauding the Obama administration and Republicans offering only modest criticism. That may be a tough sell. 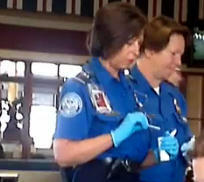 As the Thanksgiving travel period draws near, the reaction to TSA's new procedures has been visceral and sharply critical, driven by cell phone recordings of security line incidents, privacy and health concerns, and Web sites such as the Drudge Report, which published a photograph of a hands-on examination of a nun with the caption: "THE TERRORISTS HAVE WON." Monday's "Colbert Report" called them machines "that X-ray your X-rated parts," and a software engineer from Oceanside, Calif., became an Internet sensation after telling a TSA screener: "If you touch my junk, I'll have you arrested." It's difficult to gauge how widespread the dissatisfaction has become. A Rasmussen poll released November 2 suggests that 69 percent of Americans would rather go through full-body scanners rather than be subjected to pat-downs that can involve genital touching usually reserved for intimate partners. An even higher percentage of Americans support full-body X-ray machines, according to a subsequent CBS News poll, but the wording of the question only referenced "electronic" screening, without mentioning health or privacy worries. In room 253 of the Russell Senate Office Building this morning, however, Democrats sought to downplay public concerns. Sen. Claire McCaskill, a Missouri Democrat, suggested that the public outcry was a problem of education: if Americans learned more about the TSA's new procedures, they wouldn't object to the new searches. The federal government needs to "make sure they understand the risks that we're trying to address," McCaskill said. "And then I think we can--the majority of Americans I think--I hope will become supportive of the measures that TSA is trying to do to keep us safe." Republicans on the Senate Commerce, Science, and Transportation committee were more skeptical during today's hearing, though not one told Pistole to end the new searches. Sen. Jim DeMint, a South Carolina Republican, acknowledged that "we're getting hundreds of calls" from constituents about the new security procedures, but he stopped short of criticizing them. "You're doing what you can to try to modify this in a way that seems reasonable to people and to keep them safe," he told the TSA chief. "You've got a very tough job, but I mostly just wanted to thank you for what you're doing." Sen. Johnny Isakson, a Georgia Republican, suggested that it was "sort of insensitive" for Homeland Security Secretary Janet Napolitano to say this week that if Americans "want to travel by some other means, of course that's their right." That's not practical for someone flying from Georgia to San Francisco, he said. The only senator to raise significant concerns was George LeMieux, a Florida Republican, who said he had no problems with the full-body X-ray machines, "which I think are fine and appropriate." But, he said, "I'm frankly bothered by the level of these pat-downs. I've seen them first-hand in airports in Florida. I wouldn't want my wife to be touched in the way that these folks are being touched. I wouldn't want to be touched that way. And I think that we have to be focused on safety, but there's a balance."